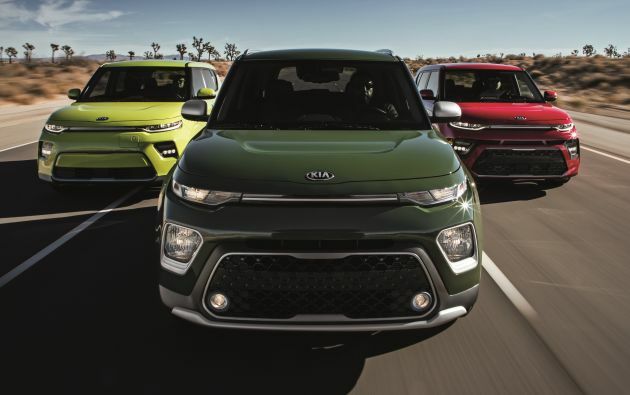 Kia has cornered the boxy compact car market in the United States and made it its own with the Soul, as competitors like the Scion xB and Nissan Cube have fallen by the wayside. Now in its third generation, the quirky offering gets an even more distinctive design. 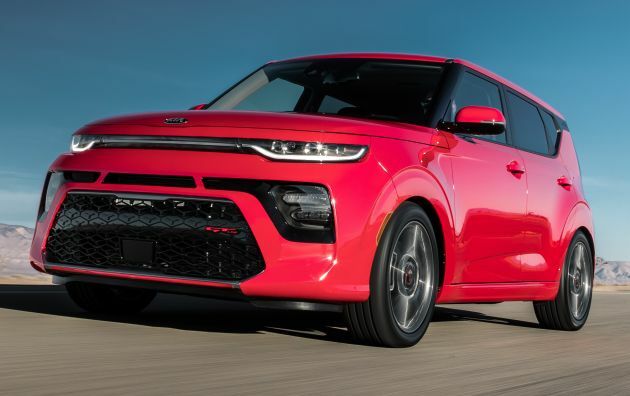 Seen from the front, the Soul adopts the split headlight design that’s all the rage these days, and with the optional full-LED headlights, the slimline upper units are the main lamps, joined together by a connecting trim piece to emphasis the car’s width. The horizontal daytime running lights and indicators are down below, flanking the huge “tiger nose” grille. The side view is cleaner without the fake air vents aft of the front wheels; there’s now just a arrow-shaped character line on the fenders. The upswept beltline is now complemented by a blacked-out C-pillar garnish with the Soul script for that all-important “floating roof” look, while the roof gets new mounting points for roof racks and the like. Around the back, the previously vertical tail lights are now boomerang-shaped and extend into the tailgate, while the upright rear windscreen and body-coloured “island” remain. New for the 2020 model year is the GT-Line variant that adds a more aggressive front and rear fascia, red exterior accents, gloss black life mirrors and 18-inch alloy wheels, while the new X-Line throws in body cladding, overfenders and roof rails for a more off-road-ready look – similar to the Picanto X-Line. 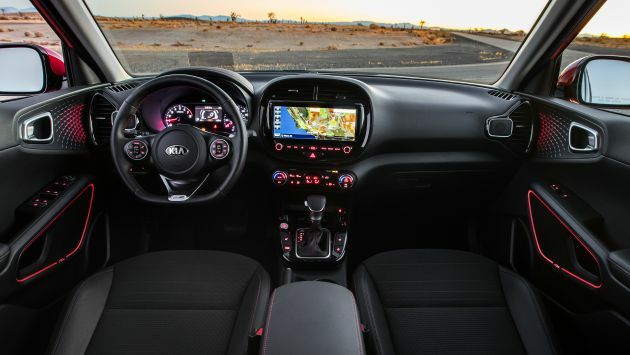 Kia says the Soul has been inspired by music ever since the 2009 original, and this time the designers drew inspiration from the “emotional visualisation of sound”, with acoustic-inspired elements on everywhere from the seats to the door panels. There’s also an ambient lighting system with customisable colours and “moods” including the painfully crass “Hey! Yo!”, “Party Time” and “Romance”. Other features include prominent tweeter speakers on the dashboard, Apple CarPlay and Android Auto functionality as well as optional features like a 10.25-inch centre touchscreen, eight-inch head-up display, 10-speaker, 640-watt Harman Kardon sound system, dual-zone automatic climate control, Qi wireless smartphone charging. The GT-Line variant sets itself apart here as well with a flat-bottomed steering wheel. Being slightly longer than before, the Soul is said to be better packaged to improve accessibility to the interior, with larger front door openings, a wider and lower tailgate for easier cargo loading and unloading, an “easy grip” tailgate handle and a dual-level boot floor to accommodate taller items. Safety is another area that has been improved with the increased use of Advanced High Strength Steel (AHSS), hot-stamped components and structural adhesive for a more rigid body structure. 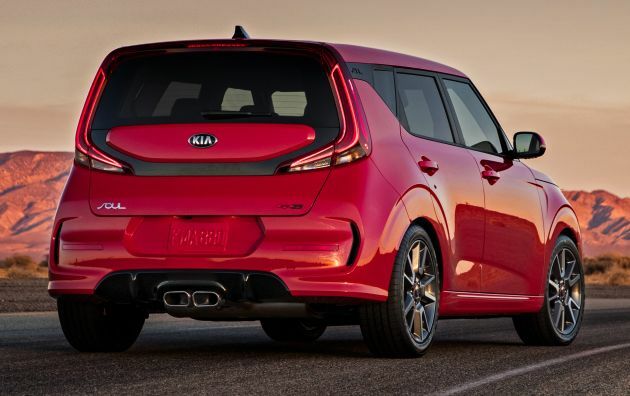 Kia expects the Soul to achieve the highest ratings from the Insurance Institute for Highway Safety (IIHS) and National Traffic Highway Safety Administration (NHTSA) in the US. Additionally, the Soul is also available with a range of Kia Drive Wise safety assistance systems, including Forward Collision Avoidance (FCA) with pedestrian detection, Lane Keeping Assist (LKA), Lane Changing Assist (LCA), Driver Attention Warning (DAW), Blind-spot Collision Warning (BCW), Rear Cross Collision Warning (RCW), Smart Cruise Control (SCC) and High Beam Assist (HBA). Under the bonnet, the Soul has graduated to the 2.0 litre Nu naturally-aspirated four-cylinder engine from the new Cerato making 147 hp and 179 Nm of torque, paired to either a six-speed manual transmission or a CVT that Kia calls an Intelligent Variable Transmission (IVT) – another item nicked from the Cerato. The GT-Line is also available with a 1.6 litre turbocharged and direct-injected mill producing 201 hp and 264 Nm, mated to a seven-speed dual-clutch transmission. Models equipped with this engine are also blessed with larger brakes, a sport-tuned suspension setup and twin centre-exit exhausts. Last but not least is the Soul EV, which features a 201 hp/395 Nm electric motor and an all-new 64 kWh liquid-cooled lithium-ion polymer battery, with standard Combined Charging System (CCS) DC fast charging. It also comes with a smart regenerative braking system, which is adjustable via steering wheel paddles and can automatically adjust the braking force based on a vehicle being detected in front. Wow, look at Kia. Can come out with 201 BHP car plus EV models. Mind you, Kia just started 10 years before Proton was born. Proton on the other hand, struggles with 50,000 sales per annum. So based on your logic, Toyota should come up with 400 BHP car for mass coz it was started long before Kia. Toyota goyang kaki and lepak in office. And according to basher fake history, P1 started during Merdeka 1957. You obviously failed in Maths and History and some say English as well. No wonder u had to stay in school. I wonder if you got the facts right. You can’t actually say KIA beats Proton. KIA actually went bankrupt in 2007 and was bought over by Hyundai. Ever since then, they shared the platform with Hyundai and begins to turn around. Also KIA don’t sold 8m alone but Hyundai along with its subsidiary KIA sold 8m cars worldwide. (Like) Honda HR-V Sport 182ps. Shaped like Nissan Cube! Such souless design. Nice looks. Front end looks like Husband while Wife face mix with Japanese or Korean breed at the back. Wow this soul looks good for a change. Kia Malaysia please bring this in, I want to buy lah!